Venezuelan President Nicolas Maduro begins a new six-year term Thursday with the economy in ruins and his regime more isolated than ever as neighboring presidents shun his inauguration after declaring his reelection illegitimate. The 56-year-old leader was to be sworn in at about 1400 GMT by the Supreme Court rather than the sidelined, opposition-controlled parliament. He was reelected last May in voting boycotted by the majority of the opposition and dismissed as a fraud by the United States, European Union and Organization of American States. "I assume with greater responsibility and commitment the new presidential term of 2019-2025. We will win!" Maduro said in a message on Twitter shortly before the inauguration ceremony in Caracas. As the swearing-in gets under way, the OAS in Washington is to hold a special session on Venezuela. Soldiers were deployed onto the streets in the west of the capital where the Supreme Court is located amid heightened security. Pro-Maduro supporters planned a demonstration later Thursday. Some schools have suspended classes for the occasion. With the exception of Mexico, the Lima Group -- made up of 14 mostly Latin American countries -- has urged Maduro to renounce his second term and deliver power to parliament, a demand Caracas blasted as incitement to stage a coup d'etat. Neither the EU nor the Lima Group have sent a representative to the inauguration. Mexico has sent a low-level diplomat to the ceremony. Leftist presidents Miguel Diaz-Canel of Cuba, Evo Morales of Bolivia, El Salvador's Sanchez Ceren and Nicaragua's Daniel Ortega were present for the inauguration, and representatives of Russia, China and Turkey were to also attend. Maduro has gained control of virtually all of Venezuela's political institutions and enjoys the support of the military. He says he feels stronger and more legitimate than ever, but many blame him for Venezuela's economic woes, which have left much of the population living in poverty with shortages of basic foods and medicines. The International Monetary Fund predicts that Venezuela's economy will shrink by five percent next year with inflation -- which reached 1.35 million percent in 2018 -- hitting a staggering 10 million percent. Maduro hit out at his regional detractors on Wednesday, threatening to take "diplomatic measures" against them if they refuse to recognize his reelection. Last week the Lima Group called on Maduro to step down and hand power to the parliament ahead of "democratic elections." An angry Maduro slammed the Lima Group's "interventionist and rude policy" and vowed to "defend the national interest." He warned his government would "take the most immediate and crude diplomatic measures" should those governments fail to change their position "within 48 hours." While the opposition in Venezuela has tried to dislodge Maduro, it remains fractured. In March 2016, the opposition launched a failed bid for a recall referendum aimed at removing Maduro from office before the end of his term. Washington has sanctioned a number of individuals in Venezuela as it cranks up the pressure on the Maduro government it blames for the country's economic meltdown. 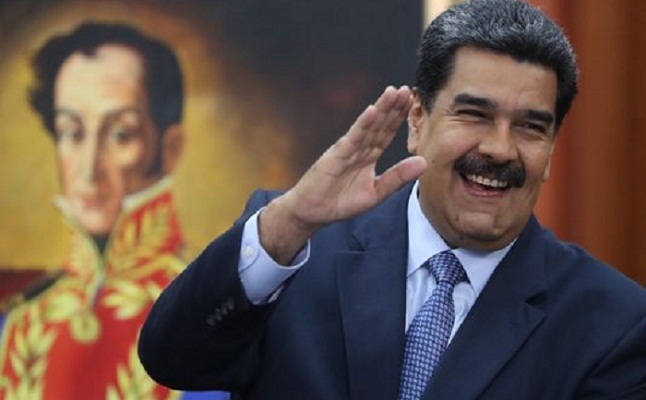 Maduro claims the sanctions cost the country $20 billion in 2018. The opposition says the government's control of foreign exchange, which has been in place since 2003, has generated $300 billion in illicit gains. According to the United Nations, 2.3 million Venezuelans have fled the country since 2015 to escape economic hardship. Anti-government riots in 2014 left 43 dead, and at least 125 people died in months of protests in 2017.